« Does a room of one’s own mean bathroom or English cottage? Woolf scholars, oft known as Woolfians, cannot be easily divided into two camps when it comes to gender studies. According to Madelyn Detloff of Miami University, there are no hard and fast lines drawn between ‘lesbian and gay studies’ Woolfians and ‘queer studies’ Woolfians. She made her point during a recent discussion about the topic on the VWoolf Listserv. The discussion was kicked off by a question from Ann Marie Lindsey, student at the CUNY Graduate Center. As a student in Mary Ann Caws’ Art and Literature in Bloomsbury course, Lindsey asked how current queer studies scholars view Virginia Woolf and/or the Bloomsbury set. The resulting conversation became a bit heated at times. But in between, the following contributions to a bibliography on the topic were offered by participants. And organizers of the 2010 Annual International Conference on Virginia Woolf promise to continue the discussion at the June 3-7 gathering at Georgetown College in Georgetown, Ky.
Julie Taddeo, “A Modernist Romance? Lytton Strachey and the Women of Bloomsbury.” Unmanning Modernism: Gendered Re-Readings. Eds. Harrison and Peterson (1997). Karyn Sproles. Desiring Women: The Partnership of Virginia Woolf and Vita Sackville-West. U Toronto P. 2006. Tirza Latimer and Jane Marie Garrity. “Queer Cross Gender Collaborations.” The Cambridge Gay and Lesbian Companion to Literature. 2010. Robert Martin and George Piggffford, eds. Queer Forster. U of Chicago Press. 1997. Christopher Reed. Bloomsbury Rooms: Modernism, Subculture, and Domesticity. New Haven: Yale University Press, 2004. ____. “Bloomsbury Bashing: Homophobia and the Politics of Criticism in the Eighties.” Genders 11 (1991): 58-80. ____. “Making History: The Bloomsbury Group’s Construction of Aesthetic and Sexual Identity.” Gay and Lesbian Studies in Art History. Ed. Whitney Davis. Binghamton: Haworth Press, 1994. 189-224. Georgia Johnston. The Formation of 20th-Century Queer Autobiography: Reading Vita Sackville-West, Virginia Woolf, Hilda Doolittle, and Gertrude Stein. 2007. Brenda Helt. “Passionate Debates on ‘Odious Subjects’: Bisexuality and Woolf’s Opposition to Theories of Androgyny and Sexual Identity.” Twentieth-Century Literature. Expected publication date: 2010. Anne Hermann. Queering the Moderns. Palgrave Macmillan. 2000. Kathryn Simpson. “‘Queer Fish’: Woolf’s Writing of Desire Between Women in The Voyage Out and Mrs Dalloway.” Woolf Studies Annual 9 (2003). 55-82. Erica Delsandro, “‘Myself—It was Impossible’: Queering History in Between the Acts.” Woolf Studies Annual 13 (2007). 87-109. 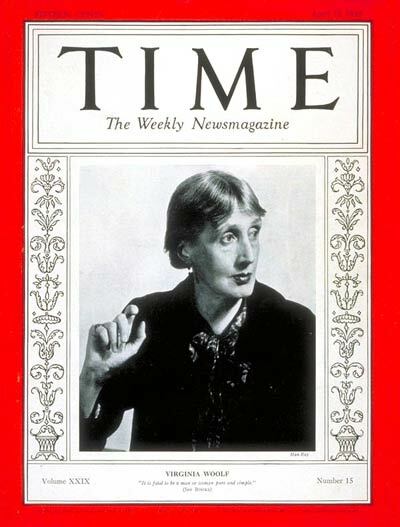 D. A. Boxwell, “‘In the Urinal’: Woolf Around Gay Men.” Virginia Woolf and Her Influences: Selected Papers from the Annual Conference on Virginia Woolf. Ed. Jeanette McVicker & Laura Davis (Pace UP 1998). 173-78. David Eberly, “Talking it All Out: Homosexual Disclosure in Woolf.” Virginia Woolf: Themes and Variations. Selected Papers from the Second Annual Conference. Ed Vara Neverow-Turk & Mark Hussey (Pace UP 1993). Madelyn Detloff. 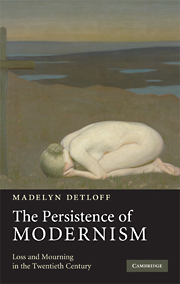 The Persistence of Modernism: Loss and Mourning in the Twentieth Century. Cambridge UP. 2009.